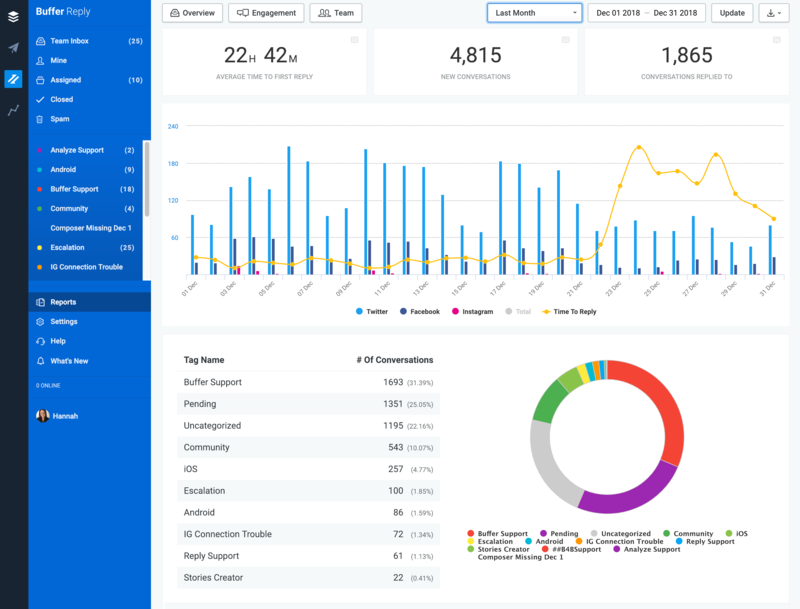 The Overview Report is where you'll find insights on your overall conversation volume and key response times, as well as a breakdown of tags being used. On our Professional Plan, you'll have a 30 day history. On our Business Plan, you'll have full history. More information on our plans can be found here. Average time to first reply is a key stat to keep an eye on. Fast responses on social media are critical to success. In one of Twitter's own studies, they found that on average, 60% of consumers expect brands to respond to their customer support requests within one hour. Where 24 hour response times are seen as acceptable for channels like email, the fast paced nature of social media creates expectations of much quicker responses. Getting familiar with our keyboard shortcuts, and setting up a few Saved Replies, are both great ways of speeding up response times. The number of new conversations, and the number of conversation that have been replied to, are also key metrics to keep track of. If you’re noticing that volume is increasing month over month, maybe it’s time for more people to join your social support team. As well as thinking about staff, spotting an increase in volume could also mean it's a good time to evaluate your current workflows. Would it be worth setting up some dedicated folders? In the chart below, you'll see the same information but on any given date. Clicking on any of the bars for a given date, will take you to a list of those conversations within the selected date range. Towards the bottom of the report, you'll see a breakdown of tags, both in a table format and a pie chart. Clicking on any of tags in the table, will take you to a list of those conversations within the selected date range. There are so many uses for tags in Reply; you might be using them to categorize your conversations for example. Categorizing conversations allows you to keep an eye on the most frequent questions and issues from customers, and watch out for trends. This can help to inform things like your self help strategy, higher level product decisions, hiring decisions, team training needs, and loads more! Various CSV exports can be downloaded from the Overview Report, by clicking the download icon at the top right of the page (next to the date picker). The available exports are listed below. Expand each section for full details of the data that is included in each one. Conversations: The total number of conversations you received. Twitter conversations: The number of Twitter conversations you received (including public Tweets, Direct Messages, and Twitter Searches). Facebook conversations: The number of Facebook conversations you received (including comments, private messages, and reviews). Instagram conversations: The number of Instagram comments you received. Conversations Replies To: The total number of conversations your team has replied to. Avg Minutes To First Reply: The number of minutes it took your team to send a first reply. This is an average, calculated from all first replies sent on that date. Avg Days To First Reply: The number of days it took your team to send a first reply. This is an average, calculated from all first replies sent on that date. This report includes the data as the Conversation Overview export, but for every hour of every day within the date range you've selected. channel: The social network the user sent the message from. source: The type of message, e.g. "mention", "message", "search". type: This is supporting information for source, which gives a bit more information. For example, if the source was "mention" or "search", then the type would be "tweet". convo: The link to the conversation in Reply. direction: Inbound messages are those sent by users. Outbound messages are those sent by your team. user: The team member who replied to the message. contact: The name of the social contact who sent you a message. This is pulled in from Twitter, Facebook or Instagram, depending on the channel. text: The content of the message. tags: Tags that were added to the conversation. convoCreatedAt: The date and time that the conversation began, i.e. when the user sent the first message. itemCreatedAt: The date and time that the individual thread within that conversation was sent. external: The link to the original conversation in Twitter, Facebook or Instagram. Unfortunately, there is not currently a way to link to Twitter direct messages, so these cells will be blank. firstReplyTimeSecs, firstReplyTimeMins, firstReplyTimeHours: These are 3 different versions of the same stat. They show how long it took for your team to reply to the message, in the form of seconds, minutes or hours. Please note, Reply is only tracking first reply time at the moment, which is the measure of time it took for your team to send a response to the user's first message. Unfortunately, it's not currently possible to see the reply time of each individual message, although this is something we'd love to add in the future. Within the CSV export, you'll see these stats for first replies, but not for subsequent follow ups. percentage: The percentage of conversations that had that tag added. conversations: The number of conversations that had that tag added. Identifying needs for Saved Replies: We look at the recent questions we've had from customers, and the responses our team has sent, and consider if any of those could be turned into Saved Replies. Things like pricing information, refund policies, and answers to complex questions are ideal candidates for Saved Replies! Performing team member reviews: We filter the report by "direction = outbound" and "team member = the person we’re reviewing", and that gives us a list of all the replies they’ve sent within the chosen date range. Calculating time to first reply for a certain tag: At Buffer, we tag all conversations with either "Buffer Support" (for our support related conversations), or "Community" (for marketing related conversations). When looking at our average time to first reply, we prefer to calculate this separately for Support and Marketing, since each team has different strategies and response time goals. Therefore, we filter the report by conversations containing the "Buffer Support" tag. Then, we calculate an average of the firstReplyTimeMins column, and divide it by 1440 (the number of minutes in a day). We then repeat that for the "Community" tag!